When you want to get your packages going, one of the easiest ways is to automated your shipping labeling. Shipping labeling systems from FOX IV produce high quality shipping labels that are quickly and accurately placed onto your shipping container or bag. Systems can use a dedicated format or an order specific format and be integrated with the order information system. All major shipping label formats, such as UPS, Fedex, USPS and DHL can be printed. Since most shipping labels use a 4″ W x 6″ L label format, FOX IV’s 4″ wide printer applicators are perfect for shipping labeling. Our Standard and Modular print and apply labelers feature up to a 16″ OD label roll capacity for extended throughput and increased time between supply changes. This is particularly evident when using direct thermal labels. Because we have such an extended range of 4″ wide print and apply units, we are able to match most existing data streams. Units are available with Zebra, Sato, Honeywell/Datamax-O’neil, Honeywell/Intermec, and Printronix print engines. For Shipping Label with Packing Slip automation, you’ll want to take a look at FOX IV’s TwinPrint™ System, not only does this system print and apply the shipping label to the shipping container, but it also prints the packing slip on the bottom side label liner. When the shipping label is applied, so is the packing slip – although it is hidden beneath the shipping label. 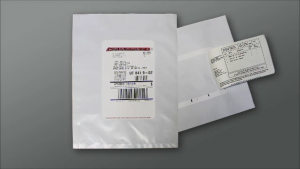 To access the packing slip, simply tear away the labeled strip and pull up to reveal. 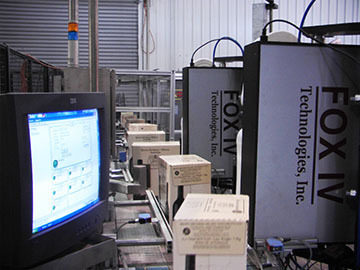 For very high throughput applications, FOX IV systems can be placed in series to print and apply to every other or every third shipping container. Our expert software engineers are able to integrate the print and apply systems to maximize throughput, ensure label accuracy and keep your shipping process moving.